There are over 200 "Outlying Islands" in Hong Kong, but only a few are inhabited or are interesting to visitors. Of course Cheung Chau is the most well known and important to visit, if you can go only to one then of course Cheung Chau is a must. Almost all visitors to Hong Kong actually have seen one other, that is Lantau because that is where the Hong Kong International Airport is located. 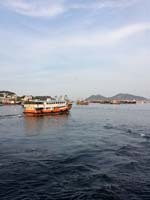 Peng Chau - An even smaller island, similar to Cheung Chau but quieter. It can also be reached via the inter island ferry.